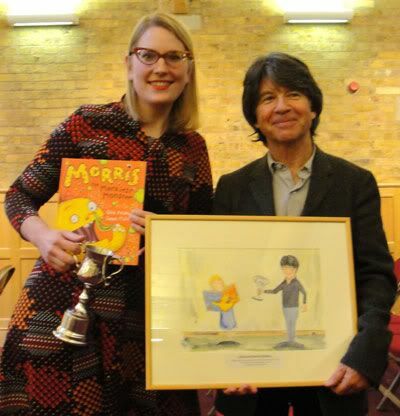 Yesterday I went up to Bishop's Stortford for their first Children's Book Festival and accepted the Picture Book Award for Morris the Mankiest Monster from Britain's Children's Laureate and children's book creator Anthony Browne. Hurrah! One of the teachers had even painted a great picture of Anthony giving me the prize. (It made us laugh, because it looked so much like us, but also because Anthony looks very tall in it.) 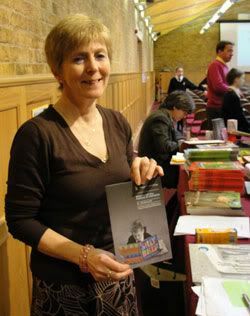 The hall had kids there from loads of schools, all whom had voted for their favourite picture book, so it was an amazing honour to win. (Thanks, guys!!) I didn't actually know our book had won until two seconds before I gave a short speech, so I was a little flustered, but also very happy. Anthony gave a talk, saying how important it was for people of all ages to embrace picture books, and stressed the importance of building visual literacy in our culture. One of the cool things about the award was that the oldest children in the school also took part in the competition, analysing the picture books and looking at them from a design and editorial perspective, thinking about what they'd do if they were creating their own picture books. 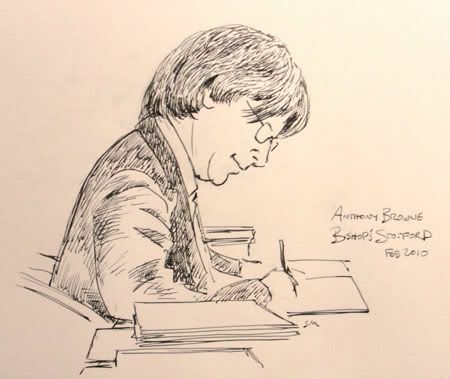 Anthony had been doing events for the festival since the day before, and was busily signing books for a long queue of schoolchildren, so I did a quick drawing of him. 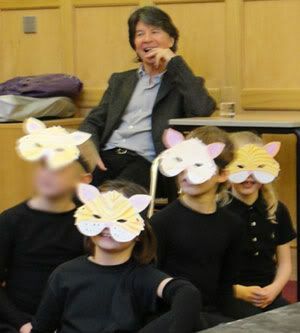 And here's a photo of the very funny cat play some of the kids put on for us. 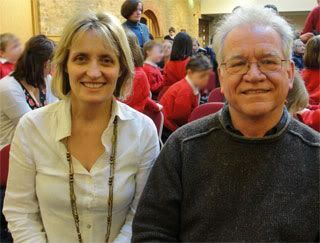 Thanks, Rosie Pike, for organising the festival, and I was very glad to meet Alison Lewis (half of the 'Jill Lewis' author partnership on Don't Read this Book) and Michael Terry, illustrator of The Wide-Mouthed Frog. After all the excitement, since I was half-way to Cambridge, I went up the rail line and kidnapped my lovely friend Bridget from her work. We celebrated by going out for bangers and mash and sticky toffee pudding and took nutty photos of us drinking from the trophy (which probably aren't suitable for a schools blog post). Congrats! Well deserved and a nice bit of silverware too. Comics fact: Stortford railway station appears in the Tintin adventure "The Black Isle". Oh my goodness, that's a brilliant bit of comics trivia. I shall remember that one! Well done - that's brilliant, and well-deserved. Congratulations to you (and Morris) on the award!!!! Congratulations also on having really cool looking glasses! that's just brilliant Sarah. Well done! Congratulations, Sarah. So, so pleased for you. Great stuff! Well deserved indeed. Thanks for that! And I still need to draw you those superheroes, I have been most delinquent on that! Congratulations Sarah. That's fantastic news. Did you eat in Browns by any chance? Hi, Nikki! No, it was some place near Bridget's work, a cosy gastro pub. Wow! Well done, Sarah! I'm proud to know you! The best trophies are those you can drink from. congratulations!